Lorraines book is on my wishlist and the fact that her recipes have won you some allotment awards is encouraging too. I love the idea of exchanging oreos for maltesers – yum. 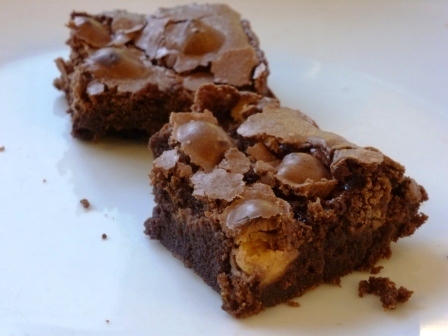 I surely love how you described the maltesers bringing that malty taste in your brownies. I can’t wait to try the same exact brownie recipe of yours. I had a craving for something maltesery and came across your recipe on a Google search for ‘maltesers recipe’. As I had also caught the episode when Lorraine made the oreo brownies this was a easy decision for a rainy Saturday morning’s baking! The result is soooo good. I doubt they’ll last long. Even more impressive as they’re my first ever attempt at making brownies! Thank you for sharing your version of this recipe – I highly recommend people try it!